Watch a video clip of US Navy SEALs in action. Watch new recruits undergo an obstacle course, part of the rigorous training to become US Army Rangers. See a British Royal Navy Commando unit taking part in cold-weather training in Norway. Watch an aspiring Commando Engineer negotiate the Tarzan assault course which every British Royal Marine must complete. Basic training for US Navy SEALS. An overview of the US Army Special Forces soldiers' equipment. Watch how an Apache helicopter and its crew can respond at a moment's notice. A video clip of a Jackal, a vehicle that can hold food, weapons and other vital equipment for long missions. Meet the elite soldiers who have been through the toughest training on Earth to take on the most dangerous missions. This thrilling insight into the secret assignments of the SAS, Navy Seals, HALO and more is full of photographs, diagrams and illustrations, and the simple text is perfect for reluctant readers. With internet links to find out more. A highly secret world revealed - at least in part! 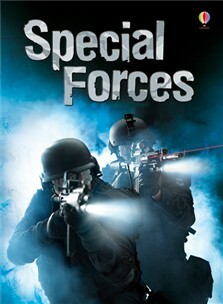 It's a fascinating insight which introduces the reader to the elite special forces working around the world today... The book has a high proportion of picture to text, thus making it accessible and enjoyable even for reluctant readers.